Maths is an essential part of both space travel and satellite programs. Satellites are one of the most important technologies we have – used for rapid communication, TV signals, weather forecasting, navigation through GPS positioning, surveillance (including spying), mapping land, monitoring ecological change as well as for telescopes to look deep into space. There are 5 special points in the Earth’s orbit which will allow a satellite to remain in a the same position over a place in Earth. These are called Lagrange points after the mathematician Joseph Lagrange who discovered 2 of these points (the first 3 were discovered by Leonhard Euler). 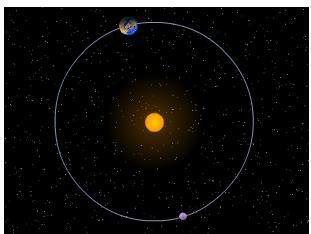 L1 is the first Lagrange point – it is a position between the sun and the Earth (in purple on the picture above) such that the gravitational pull from the Sun and the Earth cancel each other out to mean that the satellite rotates at the same speed as the Earth and so remains over the same position. Where M1 is the mass of the large object (in this case the Sun) and M2 is the mass of the small object (in this case the Earth). R is the distance between the 2 objects. If we solve this equation we can find r – and this is the distance from the small object (the Earth) a satellite has to be to remain in synchronized orbit. Then we could put these numbers and solve (probably with the help of some graphical software). Therefore, a satellite 1.5million km away from the Earth will have a synchronized orbit with the Earth. Satellites that are positioned in L1 are often ones which monitor the Sun’s activities – such as the Solar and Heliospheric Observatory (SOHO) which has discovered over 2700 comets as well as monitoring solar conditions. 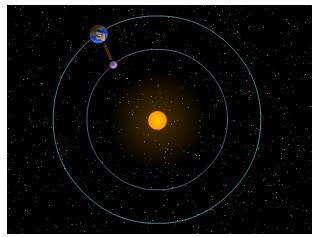 L2 makes use of exactly the same equations as L1 – but is on the outside of Earth’s orbit (as pictured). For L2, the distance from Earth is also r ≈ 1,500,000km. The L2 region is useful for observing the wider universe – and satellites launched into this area have included the Planck spacecraft which was used to map cosmic background radiation to help better understand the Big Bang and the origin of the universe. The L3 point is opposite the Earth – on the other side of the orbital path (as pictured above). r ≈ 2.9×1013km from the Sun. L4 and L5 are a little more complicated and are based such that they form an equilateral triangle with the 2 objects (the Earth and the Sun in this case). The L4 and L5 Lagrange points are interesting to study because a lot of space debris gathers there – as these points have a stable equilibrium. There are a lot of asteroids at these points. For example there are around 1700 asteroids at the stable Lagrange points (L4 and L5) of Jupiter’s orbit with the Sun. 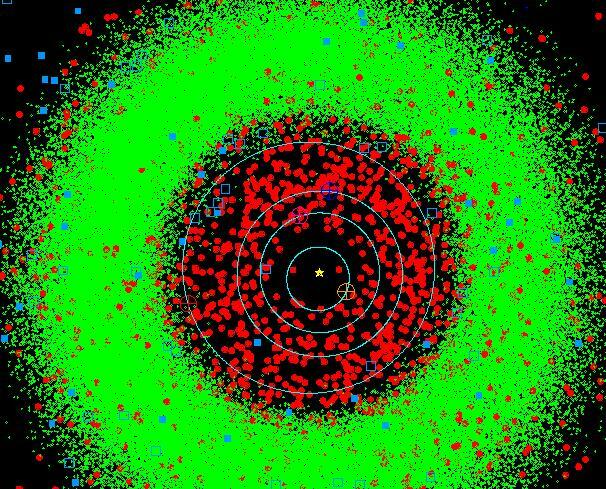 This picture above shows all the objects near the centre of our solar system. 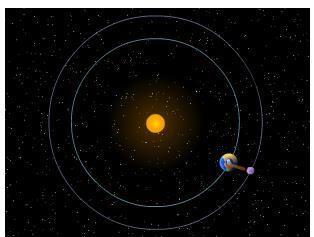 The Sun is in the middle, and each of the ellipses represents the orbit of a planet around the Sun. 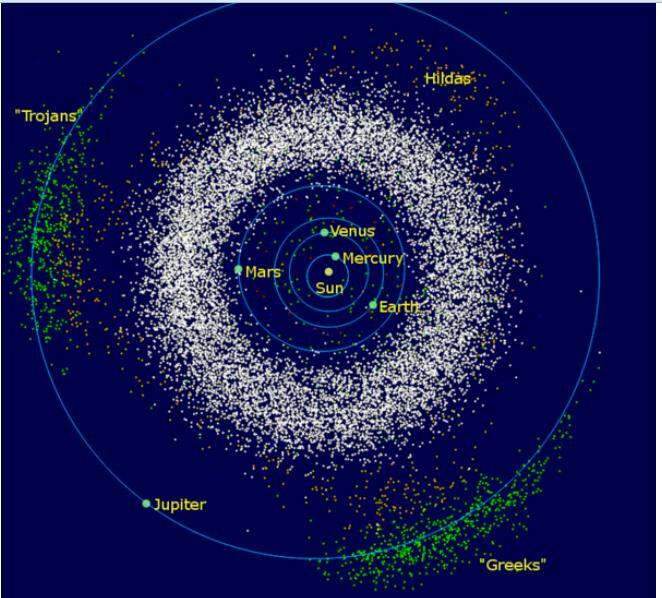 Jupiter’s orbit is the outermost ellipse – and as Jupiter orbits it has clusters of asteroids 60 degrees ahead and behind which follow it round. These are marked in green – and labelled as the Trojans and the Greeks. Using the same method it is also possible to find the Lagrange points for the orbital paths between the moon and the Earth. In this case, the Earth would be M1 and the moon M2. 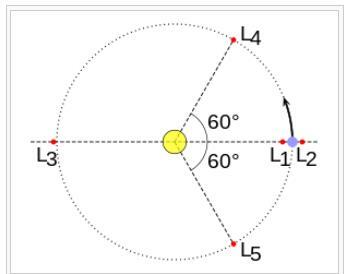 In the picture above, the Earth-moon Lagrange points are marked as LL1, LL2 etc. You can read more about the maths and the history behind Lagrange points by reading through this excellent PlusMaths article on the topic. The European Space Agency also goes into some more detail about Lagrange points and their use. « Championship Wages Predict League Position?